Enjoying a plethora of wins in 2018, Citizens Development Business Finance PLC (CDB) donned yet another laurel this year at the National Business Excellence Awards (NBEA) 2018, giving it the unprecedented accolade of having won the Non Banking Financial Institutions sector for three years consecutively. 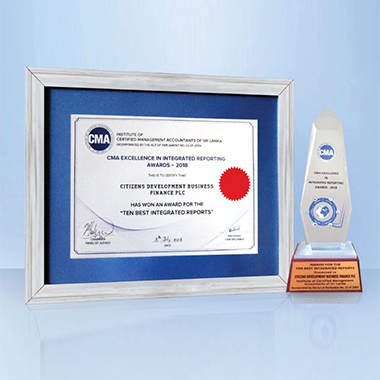 Organized by the National Chamber of Commerce of Sri Lanka in a bid to recognize businesses that display benchmarked excellence as an integral facet of its success story, this year's awards heralded a new and more in-depth criteria for evaluating excellence. Asserting its presence as a leading disruptor in the financial industry with its pioneering technological innovations, Citizens Development Business Finance PLC (CDB) gained impressive kudos at the SLT Zero One Awards 2017/18, bagging the Best Digital Integrated Campaign in the financial industry for its online financial platform CDB iNet. The CDB website also carried the second runner up award for the Best Website or Microsite in the financial industry, in an awards ceremony that recognized digital excellence in nine industry categories. Organised by the apex body of corporate organisations in the country, the Ceylon Chamber of Commerce, CDB in 2018 stood proudly as one of the country’s Ten Best Corporate Citizens, winner of the Best Corporate Citizen Sustainability Award in the Under Rs 15Bn Turnover category and gained a merit for the Best Sustainability Project for its ‘Act Early for Autism’ Awareness Campaign. Honouring excellence in reporting with governance, transparency, accountability and placing sincerity of action into the spotlight, CDB won the 2018 Best of Category – Best of Sri Lanka Grand Award for the CDB Annual Report 2017/18 at the 32nd International ARC Awards competition held in Hamburg Germany.